14-Year-Old Actor Turns Real-Life Swachh Warrior, Offers Her 1 Lakh Movie Fee To Build Toilets. 4-year-old Prathyaksha, who will step into Swachh crusader Mallamma’s shoes, has decided to offer her entire movie fee, to build toilets. 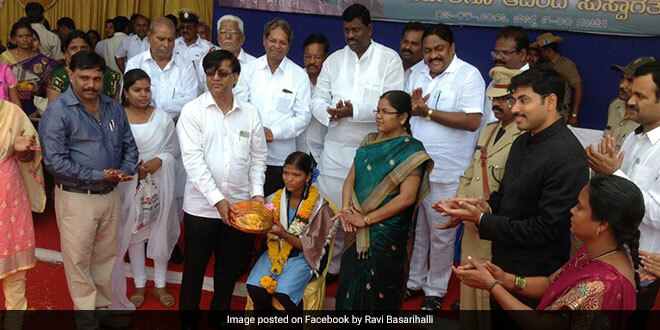 Remember Mallamma, the 16-year-old girl from Karnataka’s Danapur village who fasted for three days to convince her family to construct a toilet at home and succeeded in her mission? Yes, the one who was lauded by Prime Minister Narendra Modi in his Mann Ki Baat(monthly radio talks) for her perseverance in adopting safe sanitation practices. The toilet crusader’s character will now be portrayed in a Kannada film ‘Sandaas’ (Latrine) by a 14-year-old Prathyaksha, who is also no less than Mallamma in terms of contributing towards the cause of Swachh Bharat Mission. Prathyaksha has offered the entirety of fee as an actor towards the construction of toilets in Mallamma’s Danapur village. Prathyaksha, the Class 9 student from Bengaluru, spent around 40 days in Danapur for the film shooting which made her realise the gravity of the issue – women have to step out late at night or in the early hours of dawn to relieve themselves. I am highly inspired by Mallamma’s efforts. Now I am determined to do something concrete for the cause of safe sanitation for all. I will dedicate my acting fee to build toilets in Mallamma’s village, Prathyaksha further added. Prathyaksha’s father, who is a government employee, is overjoyed at her daughter’s decision to contribute the acting fee towards the noble cause of Swachh Bharat Abhiyan in Danapur village. Inspired by the young girl’s move, the entire film crew also joined in the effort and had planned to build 100 toilets in the village. We would also like to contribute to this noble cause of sanitation. The crew members, including the film director Ajay Kumar A J will contribute to ensure an individual household toilet for everyone in the Danapur village. We wish Prathyaksha the very best for her endeavors, said one of the crew members of the film. Notably, Mallamma’s mention by PM Narendra Modi in his Mann Ki Baat catapulted her to fame in the district. Studying in school in Karnataka’s Koppal district, some 350 kms from Bengaluru, Mallamma thanks her school for educating her about the importance of having a toilet. She helped her family literally flush out the perception that “toilet is only for the rich”. I got thrilled when PM Modi mentioned my name in his Mann Ki Baat, and now I am elated to know that a film is being produced to showcase my fight to get a toilet constructed at home. Also, I feel honoured that my character will be portrayed by Prathyaksha, who also feels for the cause of cleanliness, said Mallamma. In terms of educating others to adopt safe sanitation practices, Mallama now motivates the villagers about the need to have toilets at home. She also makes it a point to speak about the issue during the daily school assembly, which has in turn inspired her schoolmates to submit applications with the help of teachers to the authorities for help to build toilets in their houses. Previous Post: After Learning About The Health Risks Of Open Defecation, Class 10 Girl’s Hunger Strike Inspires 35 Students To Stage A Protest. Next Post: Ramdas Mane From Pune Builds Portable Thermocol Toilets In Just Two Hours. Gifts 25 Girls The Same as Their Wedding Gift.